What helps Raglan Area School stand out? Raglan Area School is acutely aware that it sits on whenua that has a long history of occupation and that extends some 700 years or more into the past. It is an area rich in diverse histories, and extraordinary beauty and bounty. We are the current kaitiaki or caretakers for this part of Whaingaroa and we are proud to walk in the footsteps of those who have gone before us, as we guide the footsteps of our tamariki towards their futures. This is a total immersion in Te Reo Maori unit with currently about 60 students, Year 1 to Year 9 students and is integral to Raglan Area School. It ensures that these students are taught through the medium of Maori language whilst being immersed in tikanga Maori. 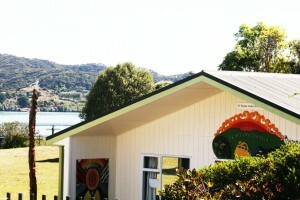 Te Puawaitanga, an‘enhanced classroom’ jointly funded by the BOT and the Ministry of Education, was opened in 2001. It has kitchen and ablution facilities plus a magnificent panoramic view of the harbour. All students at Raglan Area School are taught Tikanga Maori, including waiata and kapahaka. The whole school participates in activities that reflect and affirm tikanga Maori, including Whaingaroatanga and Tainuitanga. Te Reo is taught through out the school in line the New Zealand Curriculum document for Te Reo in English Medium schools. Te Reo Maori our ‘other’ and official language along with Sign Language. This is a Learning Initiative for mostly Year 9 and 10 students who will benefit from different learning support than what is available from the mainstream. The programme focuses on the students’ numeracy and literacy skills while developing students’ self esteem preparing them for a more successful learning path. Their classroom is named Te Piruru. This is an old Tainui word gifted to us by Tangata Whenua and refers to a temporary shelter built on a journey up a mountain. This is an option for selected Years 11 – 13 students, and focuses on an essential academic programme working towards NCEA qualification to Level 3 and University Entrance alongside the development of students’ elite surfing skills. These students are expected to maintain high academic aspirations alongside their passion for surfing. They engage in a Physical Education programme that includes specialist tuition, human biology and physiology, sports science and rigorous fitness training as well as surfing. While students from throughout NZ apply to attend the Academy, the primary intention is to nurture the achievement of our own students who are passionate about surfing. This is place based education at its very best and, as Whaingaroa has one of the world’s best left hand surf breaks, it ensures that Academy students have the experience to consistently compete successfully at National and International levels. The school has significantly upgraded it hardware, connectivity and software so that access and volumes are now generous. The whole school has had a fibre optic upgrade to improve broadband access and we are now engaged with the Network for Learning (N4L) to support teaching and learning. The school now can function entirely wirelessly and students are able to connect from everywhere within the school. Staff and students are exploring the capabilities of this environment to enhance learning and engagement. Internet safety is a priority area in our school so while students do have frequent access to the Internet, this is monitored and filtered and in accordance with our “Acceptable Use” policy. We welcome students who have ‘specials needs’ and we work hard to ensure that they are safe and included in mainstream education. The school has dedicated staff that work with students who find aspects of school challenging including a SENCO (Special Education Needs Coordinator) and RTLB (Resource Teacher for Learning and Behaviour). We employ support staff and other specialist services to ensure that they are happy, safe and engaged at school. Raglan Area School has a team of health specialists including a nurse in school, Social Worker in Schools, counsellors, and we are supported by regular visits from Public Health Nurses, dental technicians including now access for secondary students, and where we do not have expertise we are well provided for by a network of community and Hamilton based services. Education for Sustainability is nurtured across the school. This includes the whole schools involvement in the Enviro Schools project, and we are currently a ‘silver’ school and looking to become a top performing ‘green gold’ school. Restorative Practices are encouraged to build positive relationships between staff, between students and between staff and students. This then strengthens the quality of the learning environment to further facilitate learning. At the heart of the matter lies inclusion and socially responsible practices. Place Based Learning ensures that our local community and the local physical environment provide vibrant and exciting contexts for student learning. Having such a picturesque environment with ready access to the harbour and to the surf has enabled the school to foster a positive attitude to the physical environment. We have our own outdoor education area on the peninsular that remarkably few of aware of yet is one of those outstanding environments surrounded by our glorious harbour. Classes and whanau are active with Harbour Care, Beach Cleanup Day, Conservation activities, and community service. We are also leading a full coastal restoration project that is supported by Iwi, Council, Community, Environment Waikato and others. The revised NZ Curriculum outlines the eight essential learning areas and key competencies for all pupils Year 1 (New Entrants) through to Year 13 (Form 7) and is ‘best fit’ for an Area School. Our school does not have institutional breaks at Intermediate or Secondary School levels and as a result there is a continuity of curriculum and student data. We welcome the opportunity to be accountable for the learning needs of children. As an institution spanning thirteen years of a student’s schooling, we have an accumulated knowledge of our community and of our students, including their strengths, and their needs. We monitor and record student progress well, access specialist services where necessary and have a Special Needs Programme that is the envy of many schools. We also have close contact with families and most teachers know most families. Your child’s class or whanau teacher, syndicate leader or other staff will contact you. Our school has expert and fully qualified teaching staff. The Board of Trustees regularly commits to supporting staff to take study eave and sabbaticals for research and further education. Their skills are used across the curriculum and across all school levels. The specialist secondary teaching spaces (science lab, language, computer, art, workshop and food technology suites) are available to other classes too. Many of our teachers live in our community and are accessible and known to most parents. The greater Raglan Community is tremendously supportive of its school. Sports organisations actively assist with coaching and skills development, cultural groups foster our artistic and dramatic endeavours and the local business community continually support our fundraising, cultural, and work experience programmes. We are proud of these relationships that help to ensure that we provide the wide and productive learning environment that our community desires.